Keep the interior of your vehicle clean with this functional, custom floor mat. Rear floor mat has a rigid plastic core for durability, and its unique, rubberized outer shell grips carpeting while it channels and traps water and debris. Call 800-298-8924 to order WeatherTech floor mats part number WT4411762 or order online at etrailer.com. Free expert support on all WeatherTech products. 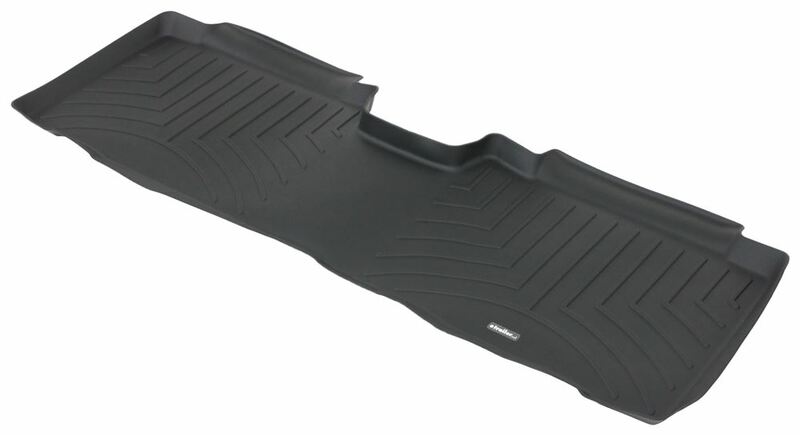 Guaranteed Lowest Price and Fastest Shipping for WeatherTech 2nd Row Rear Auto Floor Mat - Black. Floor Mats reviews from real customers. Keep the interior of your vehicle clean with this functional, custom floor mat. Rear floor mat has a rigid plastic core for durability, and its unique, rubberized outer shell grips carpeting while it channels and traps water and debris. WeatherTech floor liners accurately and completely line the interior carpet of your vehicle, providing "absolute interior protection" for your car, truck, minivan or SUV. Digital laser measurements of the interior surfaces offer a consistently perfect fit! The patent-pending, High-Density Tri-Extruded (HDTE) material features a rigid core for strength and produces surface friction with the carpet for better grip. Advanced surfacing creates channels that carry fluids and debris to a lower reservoir, which has more channeling to help minimize fluid movement while you are driving. Once fluids become trapped in the reservoir, away from shoes and clothing, they are easily removed from the WeatherTech FloorLiner over the door sill. Order: RelevanceNewestRating - High to LowRating - Low to High Keep the interior of your vehicle clean with this functional, custom floor mat. Rear floor mat has a rigid plastic core for durability, and its unique, rubberized outer shell grips carpeting while it channels and traps water and debris. Still very pleased with them...especially the cargo area mat since we have many long distance trips with our Sienna van and the mat has been perfect for protected our gear and the van interior. I am happy with the Weather Tech floor mats. One year later and they still look the same as when they were bought with 3 boys and their friends. With three sons, the floor mats and liners are the best thing to come along since the days that they sold vehicles with rubber floors instead of carpet. This is a great product, sand, mud, spilled food are contained and really simple to clean. I highly recommend to anyone that actually uses their vehicle for real life activity, especially kids sports, camping, hunting and fishing trips. Thanks for your review and your business, Paul. The WeatherTech floor mats will sometimes be misshapen when new or in cold environments. Our contacts at WeatherTech advise rolling them up in the opposite direction of the curl for a few minutes and installing them again. They should then be in the correct shape. After a year of use the Weathertech floor liners are still working great and in great condition. I pull them out for a good cleaning every 2 or 3 months and they look like new.Also bought a set for my 2011 4Runner and they are also great.Thinking about a trunk liner for the Miata now. Wonderful, sure glad we got them . Makes cleaning up after 3 messy kids ! Very pleased with the mats. They both fit perfectly in the front. Havent had any problem with the front mats, but the second row mats will not stay in place even with the Velcro sent to me from Weather Tech. Easy to clean and show very little, if any, wear. Its been about a year and the mat is doing its job as far as keeping the carpet looking new. My only complaint is the mat will not stay in place. It will slide very easy. Weather Tech sent some Velcro but it doesnt help in the movement. I have several strips on the underneath of the mat. This is all that Weather Tech offered as a fix. Dont know if I would purchase them again or not. They have offered me great protection from all the junk I bring into my poor truck. Im still trying to find some good front seat covers. Sense my dog rides up front with me. If you could help with this it would be great. Thanks Chris. Thanks for the follow up and reply about your Weathertech Floor Mats. I have also provided a link to the custom fit seat covers that we currently carry for your 2013 Silverado. Please just make sure that you select your vehicle style at the top of the page for the correct fit for your truck cab configuration. Hi John, I apologize this cargo mat is not working out and you have had a difficult time contacting our customer service team. I have contacted our customer service management about your order and they should be responding to you shortly. Mats are well worth the money, I am very pleased. Beach sand, garden mulch, rain water, slush and snow, they handle it all. I would not hesitate to recommend them to anyone. Do you have a question about this Floor Mat? Highest quality floor mats for the best price. Most detailed, accurate floor mat information available.